Looking back over the year the Australian property markets have generally surprised on the upside. 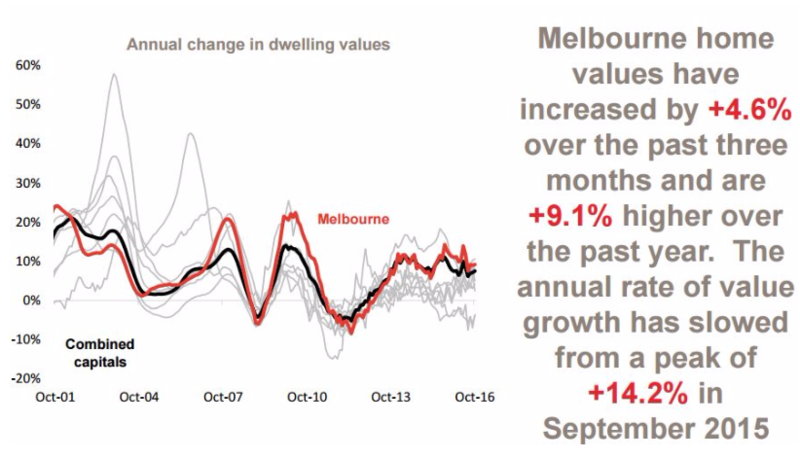 According to the latest data from Corelogic capital city house values have increased by 7.7% over the 12 months, compared to a 6.3% increase in unit values. Despite a slight retracement at the beginning of the year, Sydney property values have risen at a much more sustainable levels and Sydney’s property market will deliver double digit growth this year, driven by Australia’s strongest economy, population growth of around 1,100 new people each week, demand from affluent owner occupiers moving house and strong investor demand chasing capital growth at a time when there are fewer properties on the market. The Melbourne property market performed strongly over the last 12 months, underpinned by strong population growth (with around 1,400 new arrivals each week) and a relatively strong economy creating more jobs. 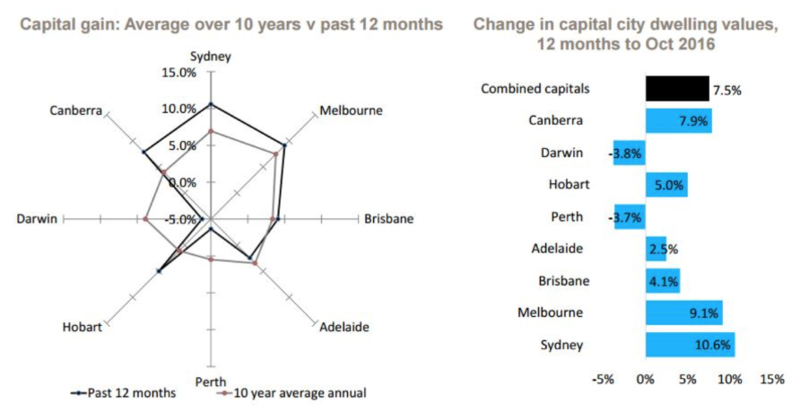 Brisbane’s annual capital growth of 4.1 percent is below the combined capitals average, in part been dragged down by weaker performance of the oversupplied Brisbane unit market (-1.4% over the year. 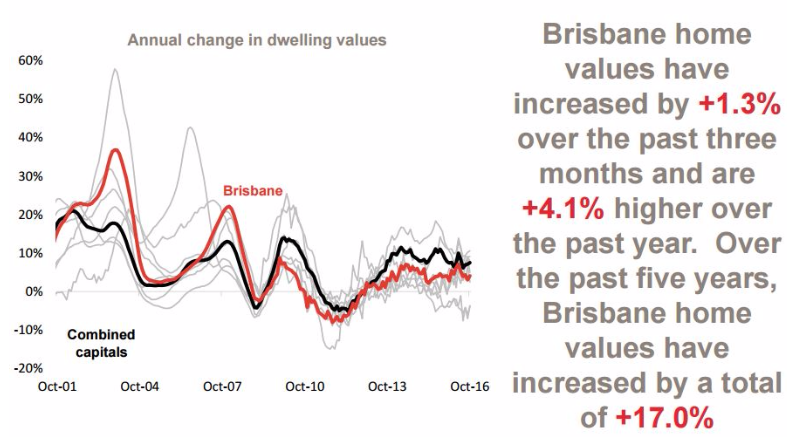 )While overall growth is sluggish, there are still some areas in Brisbane that are performing respectably and have good investment prospects. On the other hand, there is a significant oversupply of high rise new and off the plan apartments overshadowing the inner city area and nearby suburbs. Approximately 9,000 new apartments were completed in Brisbane this year, up 200% from 2015. Based on these numbers the inner city Brisbane apartment market is one to stay clear of. 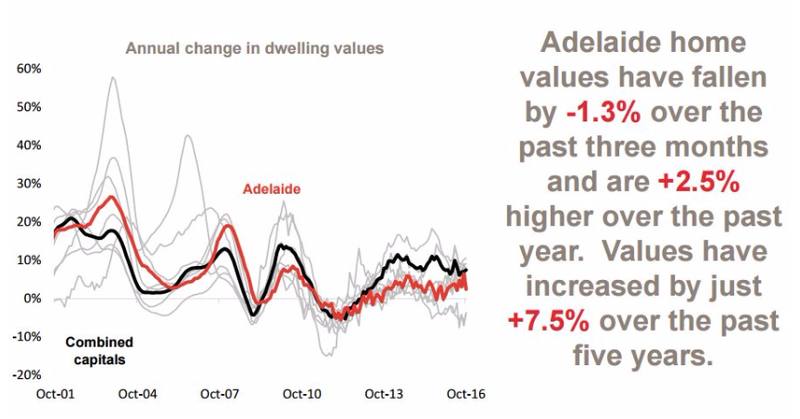 After a little flurry at the beginning of the year, the Adelaide property market has stalled and home values recording a 2.4% fall over the month. There are few growth drivers in Adelaide where unemployment (7.2%) is currently the highest of all capital cities. There are few growth drivers for Hobart property prices, and even though some commentators have been suggesting it’s a good place to invest “because it has to catch up”; with minimal population growth and slow economic growth there seems little reason for property values in Hobart to grow substantially. 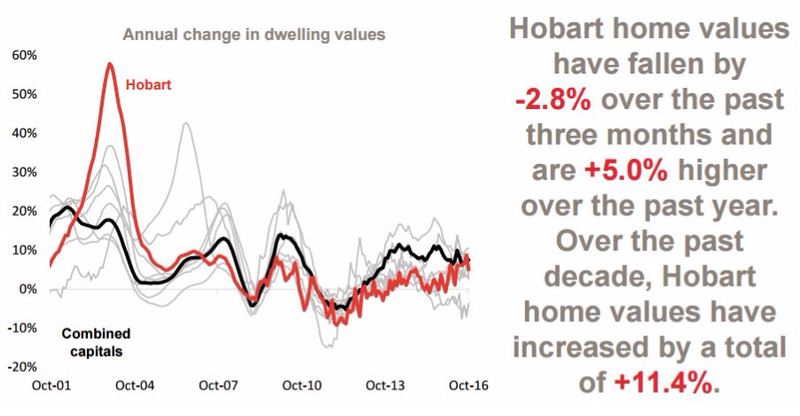 Despite a growth spurt at the beginning of the year, Hobart has underperformed over the last decade with property prices only increasing 11.4% over the last 10 years. The Perth market is still in its slump phase with values still falling and a significant oversupply of properties for sale. In fact, there are more properties for sale in Perth at present than there are in Sydney. 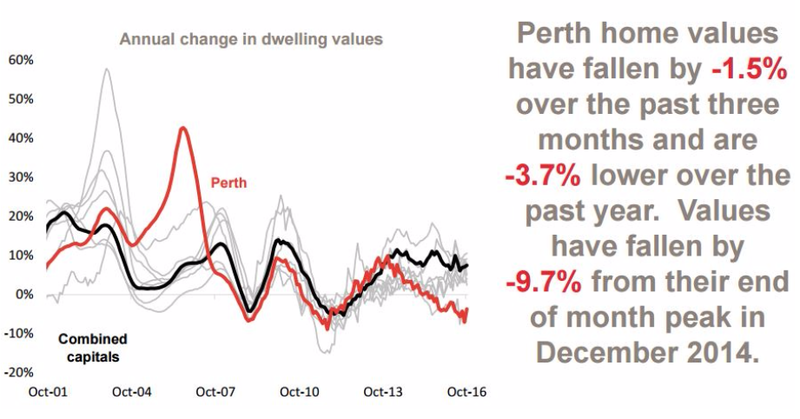 Similarly, the oversupply of rental properties in Perth is causing rents to fall. There is still some considerable downside to the Perth market as it works its way through the excesses of the mining boom. 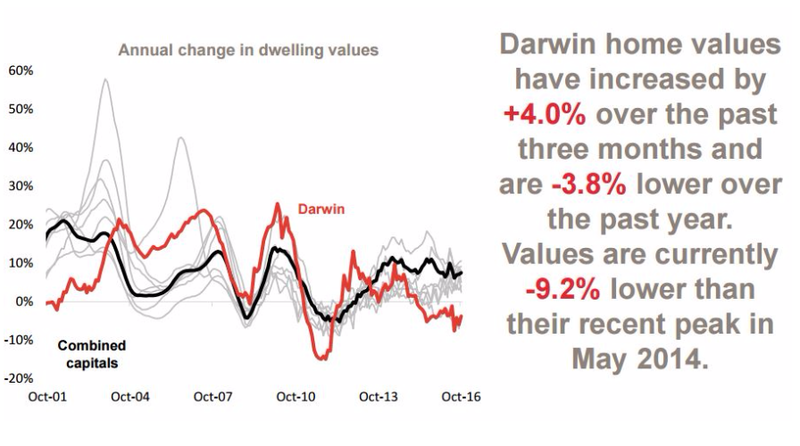 Darwin property values are lower than they were 12 months ago, and like Perth, I believe there is more downside yet to come. 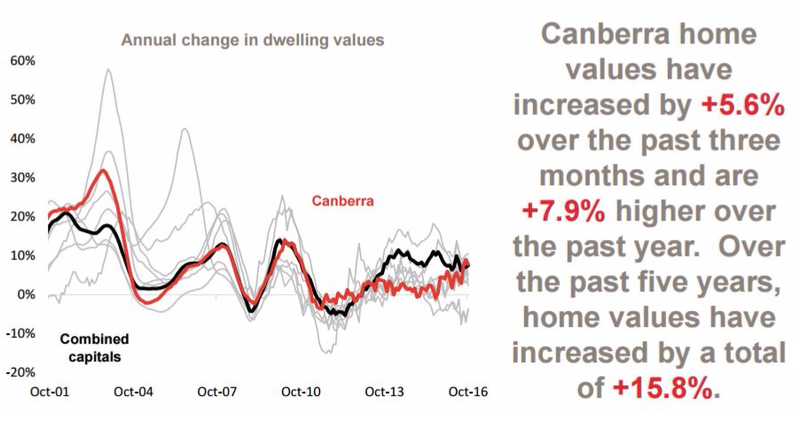 The Canberra property market has performed better than many other locations this year but there is still an oversupply of new apartments in this market. 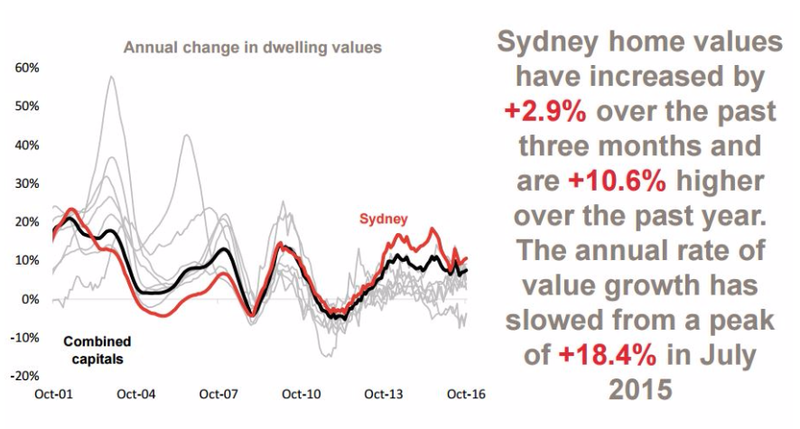 Despite our low interest rate environment and generally strong economy, Australia’s property markets are very fragmented driven by local factors including jobs growth, population growth, consumer confidence and supply and demand. Looking forward to 2017, the Melbourne and Sydney property markets are likely to once again outperform the other states as continuing demand from investors and wealthy home owners drive capital growth in sectors of the Sydney and Melbourne housing markets. 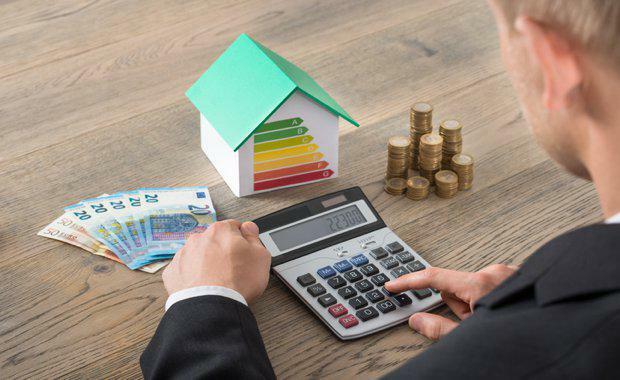 However, the looming oversupply of new and off the plan apartments in Brisbane, Melbourne and Sydney are likely to put a damper on inner-city property values and as always the level of property price growth will depend on what the RBA does to interest rates.